Our inaugural Girl Advisory Board (GAB) is here! Borne out of the deep desire of creating a participatory context where girls voices are heard and their inputs incorporated in creating programs that more accurately reflect their needs and wants, we are positive GAB will help us take girl leadership to a new level! Nallini is a high school student from Delhi. Her goals in life are to serve her nation and to make her family proud. She plans to pursue medicine and aspires to serve her nation through her work. She wants to create a gender-equal society so that everyone can pursue their dreams to make a better nation and a better world. Her Lead Like a Challenge solution focused on early marriages and teen pregnancy. She is passionate about teen pregnancy prevention and believes that lack of awareness and education is the primary cause of teen pregnancy in India. She believes strongly that mother-daughter interactions on sensitive issues, campaigning and skits in rural areas and most importantly education on use of contraceptives, awareness about negative effects of early pregnancies and youth - friendly clinics would be important in addressing the problem. She is very excited to participate in the GAB. She believes she will bring empathy and ability to express herself and solve problems to the GAB. She is looking forward to learning from and sharing her knowledge, creativity and to collaborating with other GAB members to make change happen. Basundhara is a high school student from Noida, UP. She plans to pursue English Honors from an esteemed college of Delhi University after which she would like to work with a publishing company as an editor. For The Lead Like a Girl Challenge, Basundhara addressed the issue of body shaming. She noted that one of the main problems with body shaming was the lack of awareness around it and the fact that the society at large did not view it as an important issue. In addition to educating girls and boys from childhood that every body type is unique and beautiful, her proposed solutions included creating awareness campaigns around the issue via print and social media, organizing workshops and collaboration with like minded organizations that seek to advance body acceptance. She looks forward to learning from and interacting with other GAB members. She wants to bring about a positive change in the society and make her country a better place to live in not only for the women but for everyone else. Mehar is a high school student from Delhi. She plans to pursue literature going forward and has dreams of becoming an author. For The Lead Like a Girl Challenge, Mehar addressed the issue of ‘dresses becoming an excuse for sexual harassment’. Mehar noted that patriarchy, attitude and mindset of people and weak legal framework governing sexual harassment were some of the causes behind the issue. Firmly believing that there should be no excuse for sexual harassment, she proposed creating gender sensitive programs in schools as a solution to create a shift in mindset and to nip the problem in the bud. She is hopeful that with her solution the society will stop making excuses for defending offenders and the blame will be placed where it is due. A self proclaimed feminist, Mehar is very interested in participating in the GAB and hopes to achieve a wider understanding of the women centric issues plaguing society today, of what youth like her can do and how they can overcome the hurdles they are sure to face. She is eager to do her bit as a responsible citizen and learn what she can do as a student to bring about a change. She believes her biggest strengths are perseverance, honesty and passion in all things she does and she is excited to bring those and her leadership skills to the GAB. She believes in the power of her generation and believes in their ability to solve problems and impact change. Ashmita is a high school student from Noida, UP. She sees herself as an entrepreneur and wants to open a firm for P.R. Executives for freelancing and to provide them a path to follow for success. Additionally, she has plans to start an NGO to support and uplift women. For The Lead Like a Girl Challenge, Ashmita addressed the topic of domestic violence with an innovative solution of providing entrepreneurship opportunities to women. She noted that women who were subjected to violence were dependent on their husbands and therefore, were not able to fight back and as a result, her idea of helping women become successful entrepreneurs was born. She is very excited about GAB and hopes to take in all the fresh and new point of views from everyone. She loves getting involved in various activities, specifically those involving entrepreneurship and social work. She hopes to bring in her sense of esteem, confidence and dedication to the GAB. She is also proud of her writing skills, presentation and quality of work and believes that she has fresh and innovative takes and solutions for the problems of today and is looking forward to bringing that to the GAB. Her hobbies include dancing, reading and writing poetry. Vriti is a high school student from Noida, UP. She wants to pursue MBBS and to become a surgeon. For The Lead Like a Girl Challenge, Vriti addressed the situation of the elderly women in the Indian society. She noted that elderly women faced not only mental, physical and emotional abuse, particularly, if they were financially dependent, but also faced alienation and neglect leading to serious health declines. She also noted that improving the interaction of the older generation with the younger could create a vibrant co-culture that could tackle the issue of alienation and loneliness faced by older women. With this in mind, she proposed the solution of integrating old age homes with youth internship programs turning them into enterprise and community service initiatives. She believes that bringing in the youth for internships focused on marketing etc. around products created in old age homes could be a win - win situation for both groups of people. 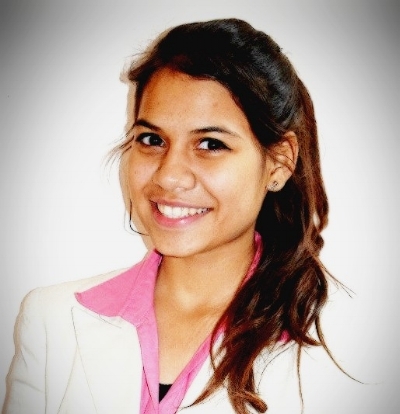 Vriti believes that she can communicate well and an aptitude for finding flaws in a plan. She believes that she can be the grounding force in the advisory board. Chetna is a high school student from Noida, UP. Her goals include graduation and post graduation in Psychology or B.Ed/M.Ed to become a lecturer at an esteemed University. Apart from that she wants to be an active, responsible, emotionally stable and a happy citizen of her country. For The Lead Like a Girl Challenge, Chetna, addressed the impact of biased social and religious customs on women. She noted blind belief in traditions, wrong interpretation or exaggeration of religious texts to be some of the causes impacting women negatively. She proposed mass awareness campaigns by schools and colleges, workshops and other initiatives by NGOs and increased representation of women in public institutions as some of the solutions to the problem. Chetna is very excited about participating in the GAB. She is looking forward to enhancing her leadership skills and hopes to work with the team to benefit herself as well as to contribute towards social welfare. Her strengths include leadership qualities, optimistic thinking, power to forget and forgive people, cooperative, helpful, creative thinking and problem solving. She hopes to bring about a positive change and hopes to add to the GAB by bringing productive and constructive solutions to problems. Anushka is a high school student from Kolkata, WB. She plans to pursue mass communication and also has plans to pursue a degree in cinematography. For The Lead Like a Girl Challenge, Anushka addressed the issue of domestic violence. She believes that the issue is one of the most glaring issues facing women today and proposed education and awareness building as one of the most important ways of curbing the problem. She believes that the awareness maybe achieved through government initiatives as well as through mass media initiatives by the public. As a member of the GAB, she believes in her ability to highlight issues that are not publicized and hopes to provide her full support.